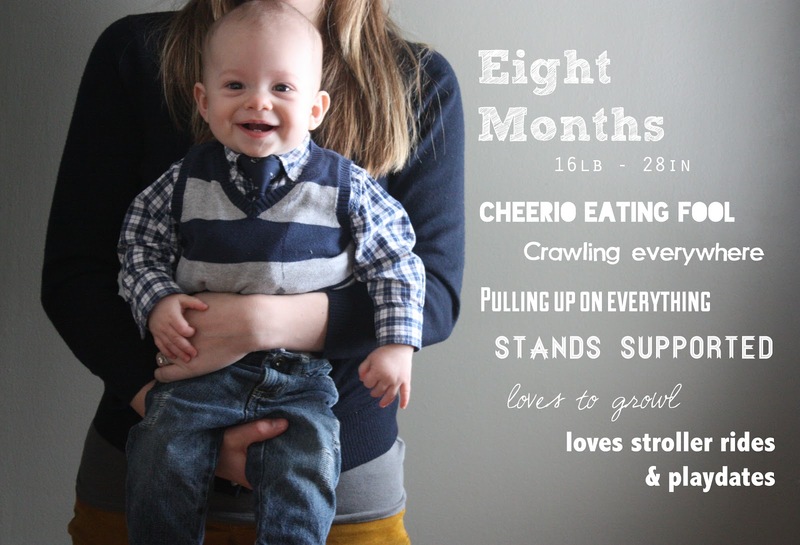 Eight-month-old Grady, you are all about your new moves. You are all over the place and I can't take my eyes off you for a second. And when I do, you're standing up chewing on the DVD player. You just got your fourth tooth, so I know you just want to try them out. But let's just leave the chewing practice to your new favorite snack of Cheerios. The way you are happily contented to sit there and snack makes cooking dinner a whole lot easier. It's one of the few times you actually sit still. You are curious and all over the place. But I can't help but chuckle at the way you look at me and smile with pride when you stand up and start banging on the coffee table. "Look at me! Look what I can do now, mama!" Yes, I see you, baby. I'm proud, too.